President Maithripala Sirisena says he will take steps to create a society of intellectuals by strengthening the free education system of the country and providing equal benefits to all the children in the country. He made these remarks participating at the centenary celebrations of the Visakha Vidyalaya , at the school premises last week. The President was warmly received by the school children when he arrived at the venue. Later, the President, addressing the gathering, commended the great journey of 100 years of the VisakhaVidyalaya. President Sirisena further said that the challenges of new technology, commercialisation and competitiveness, as well as the powerful social evils pose great challenges for the future and in that context our children should be ready to move forward while protecting our values and culture. In 1917, Jeremias Dias founded the Visakha Vidyalaya and it is the oldest Buddhist Girls’ College in Sri Lanka. The commemorative coin issued to mark the centenary celebrations of the school was presented to the President by Central Bank Governor Dr. Indrajit Coomaraswamy. Minister Ravi Karunanayake, Gayantha Karunathilaka, Secretary of the Ministry of Education Sunil Hettiarachchi, the staff of Visakha Vidyalaya, including its Principal Sandamali Aviruppola, parents and past pupils participated at this event. The Central Bank of Sri Lanka (CBSL) has issued an uncirculated silver commemorative coin with a face value of Rs. 2,000 to mark the 100th Anniversary of Visakha Vidyalaya, Colombo 05 in recognition of its contribution to the nation as a premier school in the country. The first coin was officially presented to President Maithripala Sirisena by CBSL Governor Dr. Indrajit Coomaraswamy, at the ceremony held at the Jeremias Dias Hall of Visakha Vidyalaya, Colombo 05 on 23 January 2017. The coin will be available for sale at a fixed price of Rs. 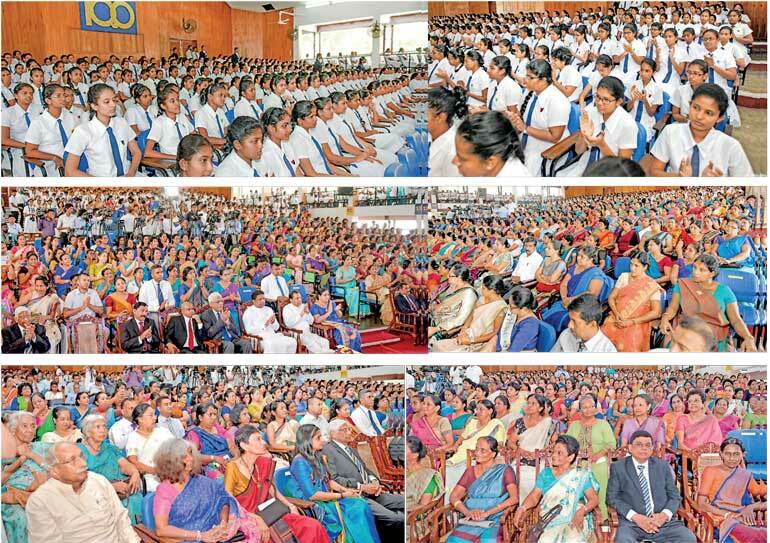 12,200 at Visakha Vidyalaya, Colombo 05. The obverse side of the coin depicts the Portrait of Selestina Jeremias Dias with the words ‘1917 VISAKHA VIDYALAYA CENTENARY 2017’ in English on the periphery and ‘SELESTINA JEREMIAS DIAS’ at the bottom of the coin. The reverse side of the coin depicts a lamp in gold at the centre. The face value ‘2000’ in large numerals with the name of Sri Lanka currency in Sinhala, Tamil and English and Year ‘2017’ appear just below the lamp. 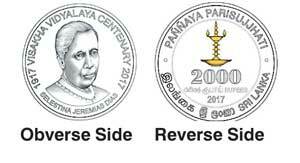 Words ‘PAAYA PARISUJJHATI’ in English on the periphery at the top of the coin and the country name in Tamil, Sinhala and English is depicted at the bottom periphery of the coin.